SOFT POTS (3 gallon) (5 PACK) Best Aeration Fabric Garden Pots from Maui Mike's. Thicker Hemp material and recycled from plastic water bottles. Eco Friendly. Fabric (3 gallon) Soft Pots with Handles for easy moving Grow Bigger and Healthier Plants Faster Roots stay cooler in summer & warmer in winter Made from Recycled Water Bottles Compact Down for Easy Storage. Protects against Gophers and Moles eating your plants roots. Grow Faster and Healthier Garden and Flower Plants. Watch you Flower Bloom more. + SIZE: (10"w x 81/2"h) 3 gallon pot. Handles for Easy Moving. +GROW BIGGER: Tomatoes, Herbs and Flowers Indoors or Outdoors. +KEEPS PLANT WARMER: in winter and cooler in summer. +ECO FRIENDLY: Made from Recycled Water Bottles and Hemp. +GROW BIGGER BETTER PLANTS:Watch your Tomatoes and Herbs grow Bigger and Faster.. If you have any questions about this product by Maui Mike's Lip Balm, contact us by completing and submitting the form below. If you are looking for a specif part number, please include it with your message. 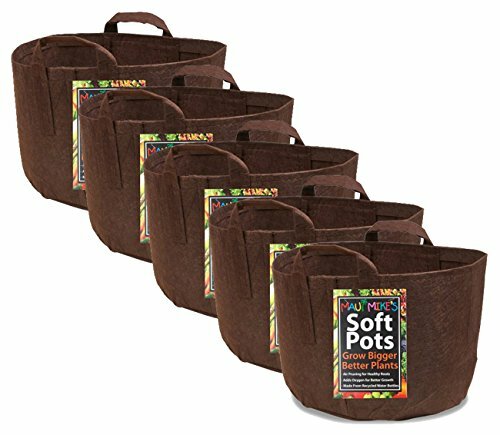 SOFT POTS (7 GALLON) (5 PACK) Best Aeration Grow Pots and Grown Bags from Maui Mike's. Sewn Handles for Easy Moving. Grow Bigger Healthier Tomatoes,Herbs and Veggies. Eco Friendly.